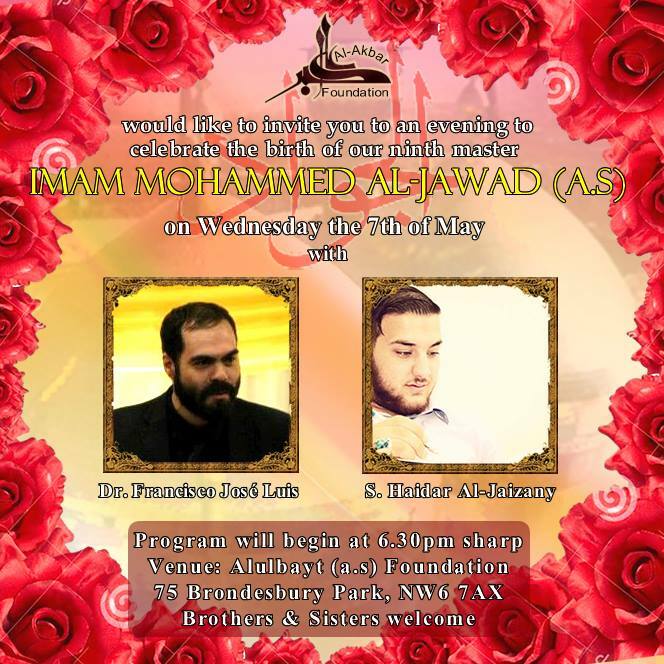 Al-Akbar Foundation would like to invite you to an evening of celebrations for the birth of our ninth commander Imam Mohammed Al-Jawad Al-Taqi (a.s) on Wednesday the 7th of May with our esteemed guest speaker Dr. Francisco José Luis and Mowlood reciations by Sayed Haidar Jaizany. Program will begin at 6.30pm sharp. Venue: Ahlulbayt (a.s) Foundation, 75 Brondesbury Park, NW6 7AX. Brothers & Sisters welcome.